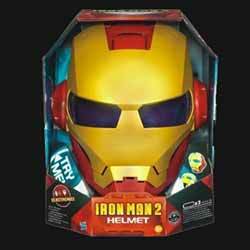 Hasbro's Iron Man 2 Helmet is a pretty authentic looking, sturdy, full head electronic toy mask. Now, while I actually think this toy is great value for money and certainly worth buying for young or old fans alike, I'm going to spend most of this review picking out the various niggles I have with it. These, however, should all be taken in the manner they are intended - as additional information to help those on the fence make up their own minds whether or not it's worth the retail price. Firstly I think Hasbro should have steered away from using the word helmet as it may confuse some impulse buyers who think it can be used as head protection while riding a bicycle. It can't, and there's no warning on the packaging that it should only be used as a toy. Now I know it might seem obvious, but the construction feels as sturdy as today's light weight bike helmets and there is an adjustable head harness and a rubber-like face guard... so you can bet some kids will be riding around on their bikes wearing this. Hasbro also make a big thing about the helmet's slow release visor. It's not slow at all... Now if it had been slow enough to match up with the opening and closing sound effect, then this would have been something to flag up, but why Hasbro has insisted in championing this feature, which... er... doesn't do as they claim, is a mystery. The intended look is that it smoothly closes like an electronic sealing mechanism when you press a button where the wearers left ear is. It's also a shame you can't push this button again to make the front of the helmet open - you have to push it up yourself. The helmet also has three buttons where the right hand ear is. Pressing each of these provides one of a number of battle and fight sounds. Press the quick mission button to hear Iron Man say dramatic phrases from the Iron Man 2 movie. The battle sounds button creates cool action noises including power up, flight and combat sounds. When you're ready to battle baddies and save the world the combat missions button will activate a mission from the Jarvis character. While these sound impressive from the outside, the effect is increased for the helmet wearer as the speaker is inside the helmet. In addition, bulbs light up the visor giving a cool blue lighting effect. The retail price sees rip off UK being targeted once again. According to Amazon.co.uk the RRP is £45.99 while Amazon.com state that the RRP is $44.99 (about £29). So if these prices are correct UK consumers are being asked to pay an extra £17 for exactly the same product. Now it's still good value for money at £46, it's just that it's almost worth buying one from America and having it shipped over to the UK. 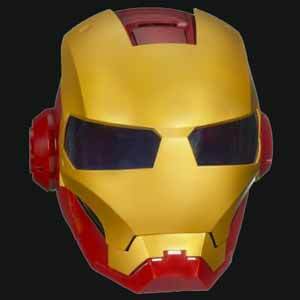 As I mentioned previously, this is a very cool item that any Iron Man 2 fan will relish owning.